being little • bristol uk fashion & lifestyle blog. : rediscoveries. I love this outfit and WOW you made that play suit..I am very impressed, your very talented. It's great when you rediscover old beauties! Feesl like you've been shopping! Loving the playsuit! Love it when that happens! 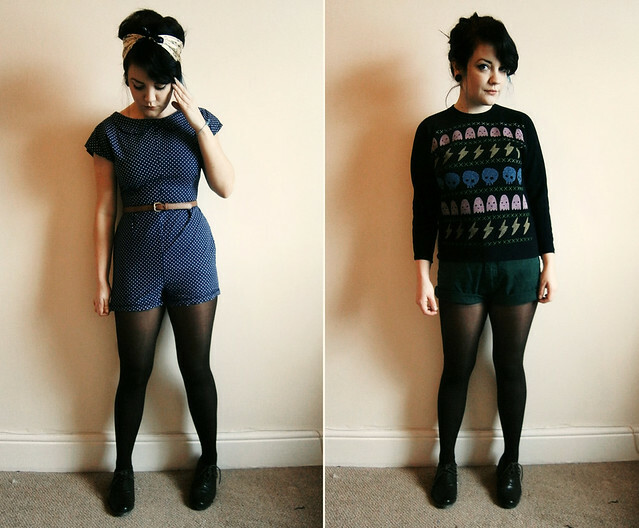 These are both great, that jumper is adorable! Gaaaah, I love that playsuit! it looks gorgeous on you. I love the sweatshirt! The playsuit really suits you - you need to get that back into regular rotation! Love the sweatshirt.. And the playsuit looks great !! Great playsuit, wish I was as talented to make something like this! That jumper is really cool too! Jumper. Amazing. That's all I have to say. Wait, you made that playsuit!? Wow! You made a playsuit? Amazing! I love the sweater.